Use a can of compressed air to blow dust and other particles out of the keyboard and touch pad. When using compressed air make sure not to shake or turn the can upside down because cool liquid may spray out of the can which can hurt you and damage the computer. Turn the computer at an angle and use the compressed air to blow out from under the keyboard and make sure no keys are sticking or dirty. Then, if needed you can take a damp cloth and wipe down the lid, keyboard and touch pad. If that doesn’t fix the keys that are sticking you should take the laptop to a professional to remove the keyboard or key caps to better clear out any remaining problems. Use the compressed air to clear out anything obstructing the ventilation of the laptop. You can do this by blowing out the vents and ports on the sides and back of the laptop. Next, you should clean the battery connections. All that is needed for this is contact cleaner and something non-abrasive to clean the contacts such as a cotton swab. Remove the battery and clean the copper contacts. Remember, it is not a good idea to just spray any liquid on the computer. 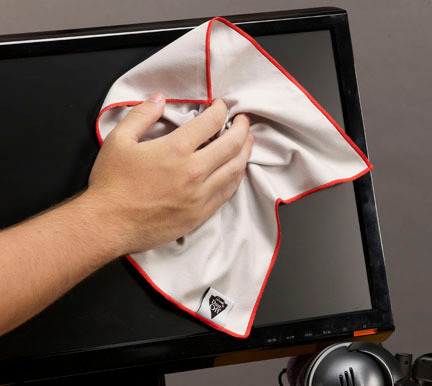 Spray the cleaning cloth you are using and not the computer itself. If you would need a professional to take care of this task for you, contact the computer experts at Perry Hall PC Repair.